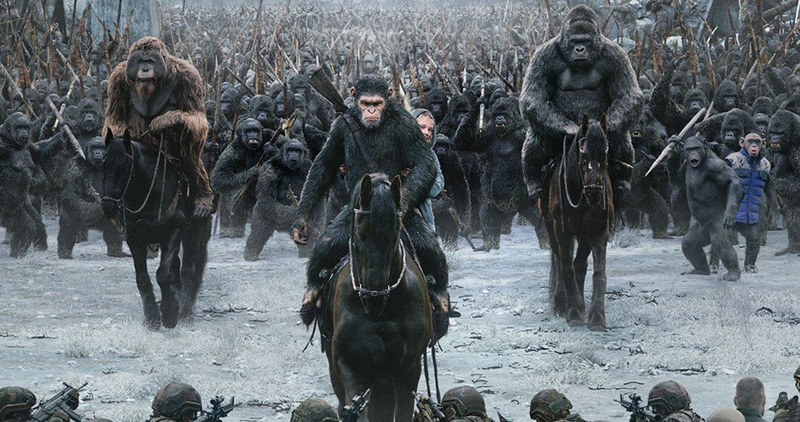 Having worked my way through the two prequels in anticipation of the third in the trilogy, I found I'd got ape-fatigue so didn't run to the cinema for WAR FOR THE PLANET OF THE APES. Big mistake. Camus salutes a timely film about tyranny. "This film is all about empathy, really, and not seeing the Other, and that's the way Matt is as a filmmaker. This search for emotionality in all the characters, and finding a balance between the humans and the apes. He never wanted to make the apes good and the humans bad; it's very well judged." 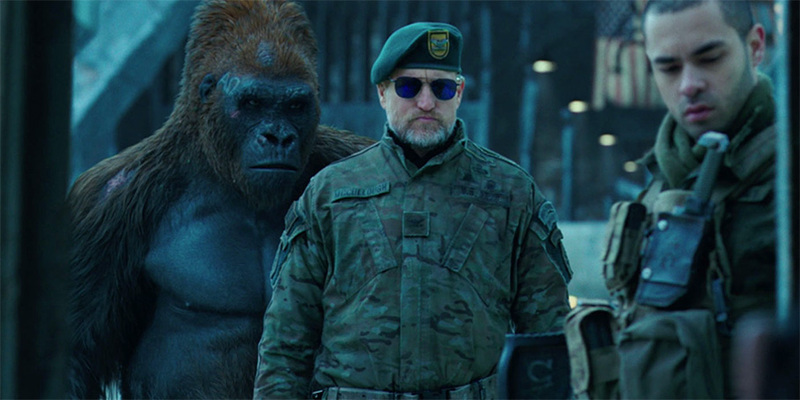 The third in the trilogy of this huge, tent pole franchise blockbuster, War for the Planet of the Apes had a lot to pay off and a few elements to set up to dovetail with the 1968 original. It does both with panache and delivers so much more besides. I read reviews throwing away Woody Harrleson's performance as one note. I think it's one of his best and pitched perfectly within the drama of the piece. He's multi-dimensional where a black-clad, twirly moustachioed goon would usually stand. Of course, the film rightly belongs to Andy Serkis whose mesmerising motion-capture performance as Caesar, the leader of the hyper-intelligent apes, is a knockout but without such great work from Harrleson, he wouldn't shine as brightly as he does. The film stunned me technically as it takes only minutes to get back into the mind space of seeing the apes as real, flesh and blood characters. There's never any doubt where our sympathies must lie but the narrative allowed original answers to oft-posed questions and I found no scene dragging or too expositional. In fact, I relished almost every minute. If anything, director Matt Reeves makes us work for our entertainment and all power to him. I have not felt such palpable satisfaction in a cinema for some time. The film also celebrates the power of simple acts of kindness, loyalty, bravery and what it means to be bonded to others. 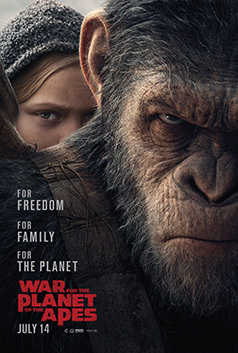 Caesar and his band of apes are living in a secluded forest and afraid for the future of mankind, armed human soldiers are sent to wipe them all out. Caesar makes a civilised gesture by setting survivors free but the Colonel (Harrelson) in charge of the assaults dismisses the gesture and with an elite team, he infiltrates the bowels of Caesar's camp that same evening and while the ape guards are subduing the assassins, Harrelson kills evoking a profound wrath and desire for vengeance in Caesar. The apes trek towards a desert where they hope they will be safe from mankind while Caesar and his back up team go after the Colonel. I won't give away much more because the way the story develops is a great part of the pleasure of watching it but I will highlight a few moments. There is an interchange between Maurice the orang-utan and a mute young girl, Nova, which is terribly touching given great weight by masterful effects work and superbly judged timing by both director Reeves and his editors, William Hoy and Stan Salfas. It's a rare, big film these days that so perfectly times its emotional moments as well as this. Reeves understands how powerful a face is – human or simian – and reaps the rewards of total audience engagement. Damn, that Oran looks good. Halfway through we are introduced to Bad Ape, a loner chimp who escaped from a zoo. He is very much the comic relief but in an integral way. There's a tiny moment near the climax where in a long shot, he clambers down a hole and just for a second, kisses Nova on the hand, the mute girl taken in by Maurice. It's a small thank you for her singular bravery. It's fleeting but boy, is it powerful. There are many moments of ape solidarity that bring a few lumps to the throat. Caesar goes through hell in this film and the smallest gestures of support or loyalty rarely get him to acknowledge them in any broad sense but Serkis, if his facial performance is captured faithfully, reacts so beautifully, with so much subtlety (if that's not a contradiction in terms). As with most performances, a lot of it is in the eyes. All the emotion on display and evoked is well earned by a sincere film which grants its audience no small respect. I have got to praise Weta to the skies, the visual and special effects company set up by Peter Jackson, Richard Taylor and Jamie Selkirk to serve Jackson's film Heavenly Creatures in 1993. In twenty-four years, not many would argue they may well have drawn level with George Lucas' ILM in terms of artistry and application. It's so easy to dismiss the work of a visual effects artist because when they are taking on reality and that reality is accepted by an audience, it becomes totally invisible. The animation, texture and lighting of these computer-generated characters are top of the line. I'm only ever reminded of their technical origins by tiny weightless seconds of getting on a horse. It's ninety nine per cent there and in terms of my engagement with them, one hundred per cent. And it just occurred to me that they are literally 'bit players'. If you've seen the previous two, it would seem remiss not to catch the superior finale, if not on the big screen then at least the Blu-ray or digital download because I am somewhat late in reviewing it. Apologies. This is bold, smart, beautifully performed big budget filmmaking and the only reason I'm not going to write further singing its praises is that I have paid work I must get done and as much as I love writing for the site and the site itself, bills must be paid. That said, there's just one more thing... A bit of an aside, but I still shake my head with astonishment at the utter believability of that tiger in Life of Pi. FX masters, Rhythm and Hues made that tiger a reality and went bankrupt eleven days before they won the Oscar. I'd advise you to check out Life After Pi on You Tube. It's a sad, sad tale of studios demanding more and more and FX companies bending over backwards to stay afloat after making a fixed and therefore unchangeable bid. If directors change their minds and work has to be thrown out or re-done, the company has to absorb those extra costs. Rhythm and Hues, you are sorely missed.